So the Giants won the World Series, which is really the most exciting news that happened this week (and I was cheering for the Royals). As expected, the US Fed finishes tapering off the third round of quantitative easing today, and the DOW opens at an all-time-high of 17, 355. 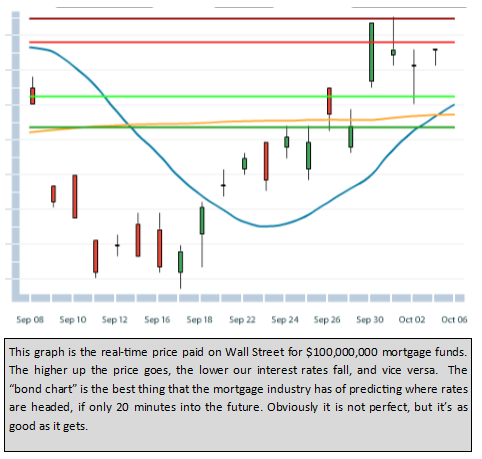 Mortgage Bonds have weathered the news at a placid repose, much the way a dying man would react while bleeding to death (seems an appropriate metaphor for Halloween). This morning’s reports show that Personal Income is up and Personal Spending is down. Go get your sugar fix today and enjoy the weather, because daylight savings and 40 degree weather starts on Sunday. Consumer Confidence was released this morning, rising up to 94.5 from last month’s 86–that’s a big jump. And it looks like that girl will confidently be at the store again next month as well since she isn’t buying anything that’ll last very long. Durable Goods Orders are down again this month by 1.3%. You want to buy something of value? Buy a home! The Case Shiller Price Index shows that home values are up another 5.6% from this time last year. In the housing market, Existing Home Sales continued to climb through the summer months, and today’s New Home Sales also shows an increase of 1,000 more annualized units closed than the previous month–though missing greater expectations. At only 1.76%, the foreclosure rate across the U.S. is at its lowest rate since February of 2008 according to Black Knight Financial Services (that’s right, Batman is an economist now that he is no longer making movies). Now that we as a society have just accepted that the Ebola virus is among us, the DOW has regained close to 500 points this week, yet Mortgage Bonds have settled in near the 17 month highs of last week–though down about 25bps from the high close on the 15th. It’s a healthy reaction (never mind the pun) to last week’s scare. I chose this picture of Grizzly Adams as a representation of current market conditions for three reasons: 1. It was my favorite show (besides Dukes of Hazzard) when I was a kid. 2. My 12 year old son just did a report on the real James “Grizzly” Adams for 7th his Grade U.S. History class. 3. It seemed more workplace appropriate than a photo of a doped-up crack head. The metaphor of the crack head could have been used because A: the markets also make decisions based on irrational fears and B: the markets currently “need” low interest rates to get through the day. As a continuation and clarification of my commentary yesterday, I want to reiterate that we are not in a “normal” market. In a normal market, good news (whether economic or political in nature) leads to higher stock prices and higher interest rates, while bad news leads to lower stock prices and lower interest rates. 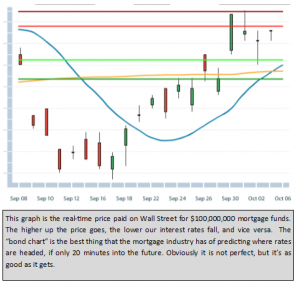 Mortgage Bonds have seen reduced yields this last week as stock prices have plummeted over the anticipation of rising rates cutting into profitability. Thirty year rates for FHA are at 3.25% and conforming conventional loans are at 3.875% today, while 15 year rates are down at 3.0%. (APR will be higher, depending on the amortization term, and the loan and down payment amounts–as closing costs and the presence of mortgage insurance affect each loan differently). The DOW fell below 16,000 just after the opening bell before bouncing up a bit, though still down 200 on the day. Mortgage Backed Securities shot up like a rocket this morning, but have since fallen down to the opening bell price creating a hanging man pattern. It’s named for the shape of the candlestick, and also because if you bought at the high today, you just lost a lot of money in a two hour period. Scholars will tell you that the hanging man pattern is a sign of a reversal, meaning that prices will drop again and rates will go up from here. All day long people ask me what I think is going to happen, so here’s my prognostication: I think that fundamentally the move this morning was too quick even if the Ebola virus is spreading, the EU is struggling, and Quantitative Easing is stopping–but I don’t see rates going back up tomorrow. I still feel that stocks are overbought and overvalued, and that corporate profits are in some measure a result of low interest rates. Consequently, when rates start to rise, profitability will shrink and stock prices will shrink further. Fortunately for my 401(k), the subsequent selloff in stocks will flow into bonds, keeping rates from rising too rapidly. That’s just my take. Whatever happens, today is an interesting day. Continuing global uncertainty (political and economic) is taking a toll on stock prices this week as is the dissection of the Fed minutes which revealed underlying risks in our rebounding U.S. economy. As a result, Bond pricing improved this week to levels not seen since June 2013, pushing interest rates 1/8% lower! After my two sentence commentary yesterday about the bears ruling the markets, the DOW made almost a 400 point run up from the bottom. (Really, it was the Fed minutes showing that inflation should remain low and the dollar strong longer than anticipated.) Today however, stocks have given up almost all of yesterday’s gains, currently down 296. Weekly Jobless Claims come in lower than expected this morning, but still show 278,000 folks applying for unemployment for the first time last week. All of this is really boding well for bonds, the 10 year treasury note down to its lowest level since June of last year. Will Dogged Determination Win the Day? CoreLogic reports that home prices rose 6.45% for the 12 month period ending August 2014. Home prices nationwide are still 12.1% below the peak established in April 2006. Our climax in Utah came just over a year later. This morning’s JOLTS report showed that there 4.8 million job openings and 4.6 million hires in the month of August. Non-Farm Payrolls were released last Friday while I was golfing with my brother, but there aren’t any economic reports being released today, and really nothing scheduled at all this week save for the Fed Minutes being released on Wednesday. The BLS reports that almost a quarter million new jobs were created last month, sending the Unemployment Rate down to 5.9%. Stocks and Bonds are both flat today, and you can see from the chart here below that mortgage backed securities (MBS) have had a nice climb in price the last two weeks to summer ’14 levels (leading to the lower interest rates we are now again enjoying). I of course hope that we can finally break out through the ceiling of resistance (the red lines) that’s suppressed bond pricing since June 18, 2013. This would send Fannie/Freddie rates back down into the 3’s, but I feel sick to my stomach thinking of the implications of the economic data/political unrest necessary to get us there. Stocks are down and Bonds are up on the ISM Index reading (a national manufacturing index based on a survey of roughly 300 industrial companies–like many reports, a measure of 50 or higher is considered “positive”), which was reported at 56.6, down from last month’s cheerier 59.0. For all intents and purposes, this is a technicality which cannot be solely to blame for the DOW being pushed down 115 points as we start off the fourth quarter. The real culprit is the continuing drama in Europe which should help the dollar gain strength over the Euro in coming months. AND, the unknown around the Jobs Report which will be released this time tomorrow morning.